Buffalo Harbor State Park opened less than a year ago and it has become a true destination for Buffalo families. The modern playground is a fun place for kids to run, climb, bounce and explore. 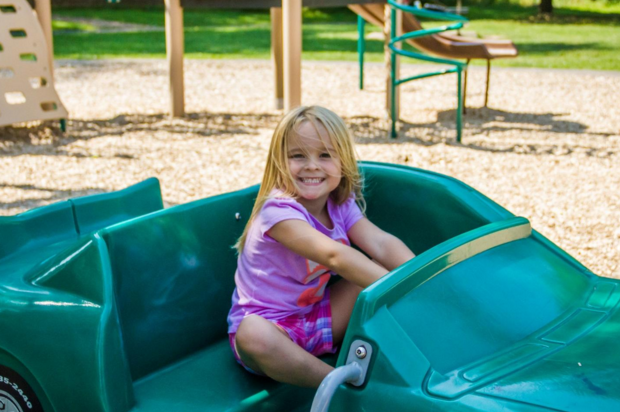 The playgrounds of Burchfield Park are fun, and there are plenty of other kid-friendly attractions, too, like huge insect sculptures, hiking trails and spots to wade into Buffalo Creek. The Burchfield Nature and Art Center is also a hub of activity, with classes and events happening all year long. Location: 2001 Union Road in West Seneca. 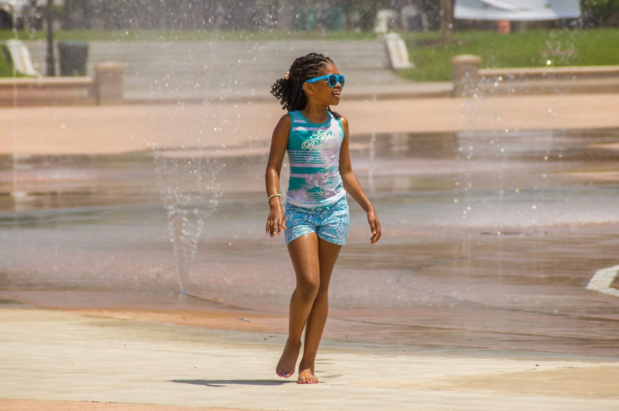 Caz has a spot for everyone, but it’s the giant splash pad that little ones love. There’s a playground and a pool, too. This park, located in the South Buffalo neighborhood, has athletic facilities for basketball, soccer, golf, ice skating and baseball. Cazenovia Creek cuts right through the middle. Location: the intersection of Abbott and Potters Roads in Buffalo. Parents particularly like Dingens Park because of the separate play areas for younger children. The community pool is also a draw, along with the soccer fields. There’s lots of space to hike and picnic, and the park is often the site of community events. Location: Dingens and Alaska Streets in Cheektowaga. The playground in Delaware Park. Photo courtesy the Buffalo Olmsted Parks Conservancy. Nationally-recognized Delaware Park is the Central Park of Buffalo, and the new playground in Rumsey Woods is a great spot for kids to play. There are plenty of other places to explore, like two additional playgrounds and stone pathways tucked away in lush gardens. Location: between Delaware Avenue and Highway 5. Though Front Park has a more formal feel than other parks in the city, the location is still extremely popular. Kids can climb all over the playground equipment and there’s plenty to explore, like the Peace Bridge. Location: Porter Avenue and Baird Drive. 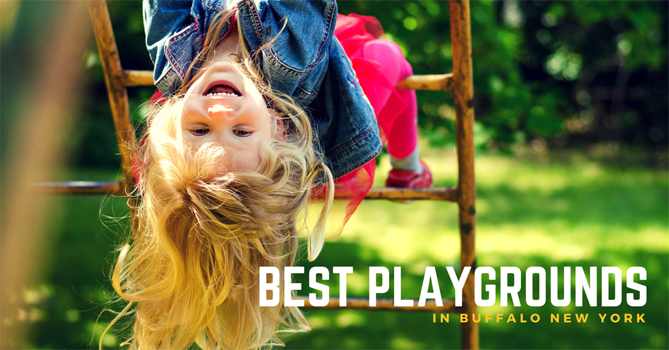 There’s plenty of green space to play at LaSalle Park, but the buffalo playground is truly unique. Buffalo statues incorporated into the play equipment. Children can climb the statues, and one has a slide that comes out the side. Parents will enjoy the waterside views, where the Niagara River meets Lake Erie. Location: Porter Avenue and AmVets Drive. Hours: sunrise to sunset. However, fishing is allowed 24 hours a day. The splash pad in Martin Luther King Jr. Park. Photo courtesy Buffalo Olmsted Parks Conservancy. You have your choice of among three playgrounds at Martin Luther King Jr. Park. Also, the giant splash pad is perfect for warm weather. If you’re looking for indoor activity, you can also stop by the Buffalo Museum of Science, which is inside the park. Location: North Hampton Street and Martin Luther King Park. After you play at the Riverside Park playground, little ones will enjoy seeing the working lighthouse. This neighborhood park also has a pool and several athletic fields. Location: Vulcan and Niagara Streets. Enjoy the splash pad or pool during the summer, or take children to the playground any time of year at this neighborhood park. Houghton Park is also a hub of community events year-round. If you’re ready to find the perfect place to live in Western, Central or upstate New York, let one of our experienced agents help you find the right neighborhood and home for you.